3-D Monster: Halloween Decorations From My Youth! While decorating the house for Halloween this weekend, I couldn't help but to think of Halloweens' gone by and the fun I had as a child digging out our decorations and working to make our house the scariest one on the street! Here are just a few examples of decorations I remember having back then - maybe you had some of these, too! These were purchased sometime in the 80's I'm pretty sure - never was a huge fan of the art, though. I always liked this big-headed witch even though I didn't think she was very scary. Definitely early to mid-seventies. 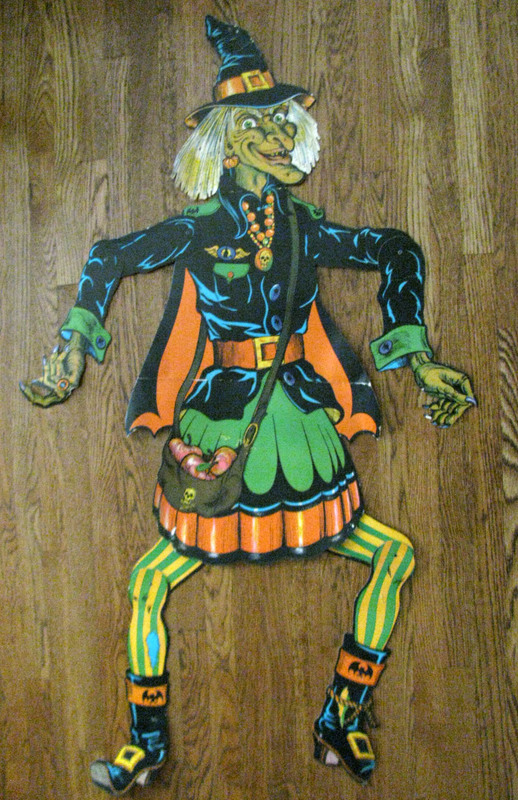 The full-size jointed Scarecrow - never did care for this one because there was absolutely nothing scary about him, but mom liked him, so I reluctantly hung him up... on the back door. This witch's head was actually from my Grandmother's house and must have been very old. I remember the cardboard was much thicker on this one, and I always liked the vintage look to it. 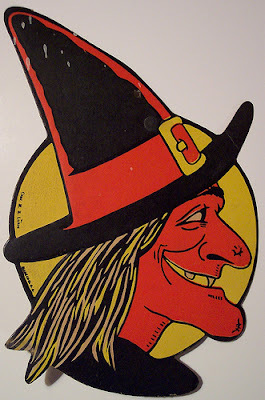 This witch was my all-time favorite decoration! Dig that detail!! I've tried to find one online for sometime now, but you can't touch it for less that $60! This gal always had a place of honor on our front door! You can't have a creepy witch without a couple of black cats around! 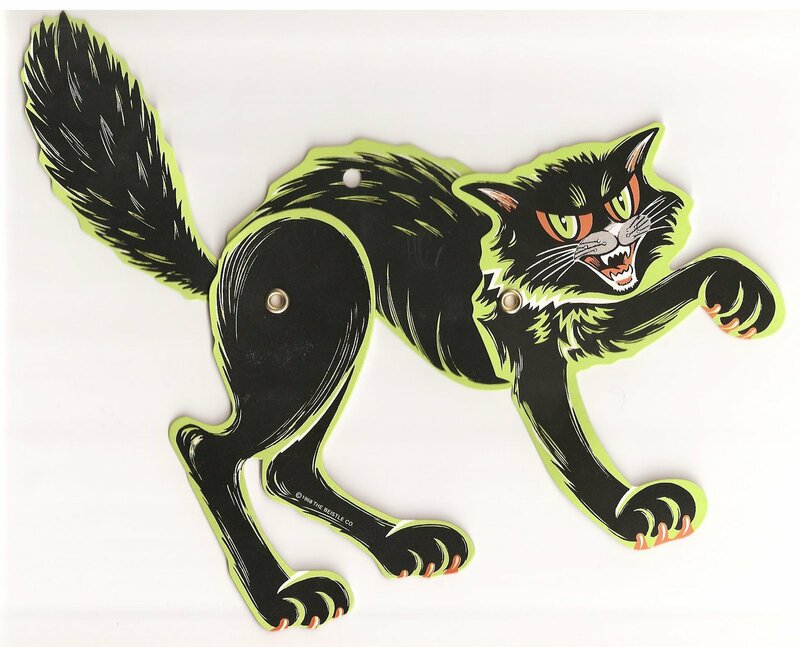 We had two of these that always stalked our front porch window. Ah! 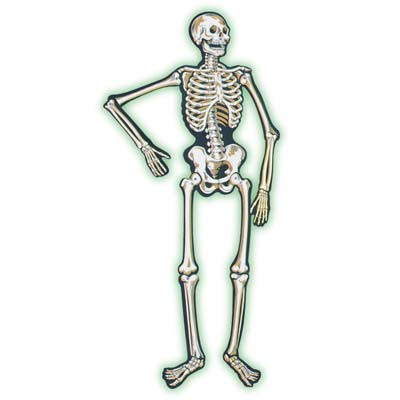 The classic full-size jointed skeleton! We always had one like this as well as two of his smaller brothers. 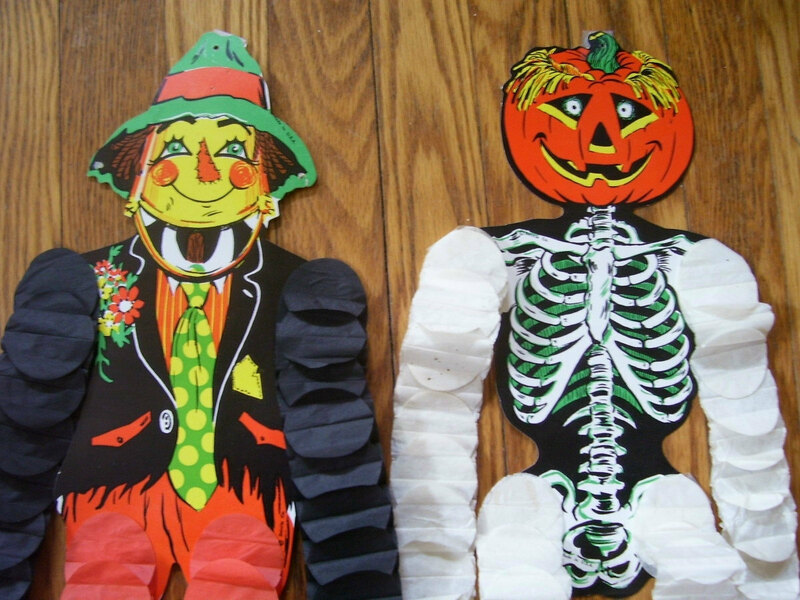 Because of the easily torn arms and legs, these guys were always used as inside decorations. 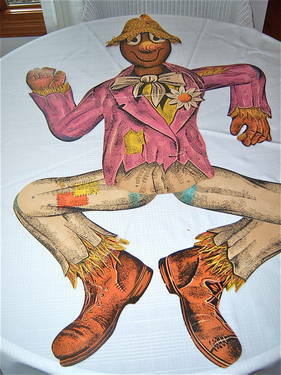 Never cared too much for the scarecrow, but always loved the skeleton with a jack-O' lantern head! 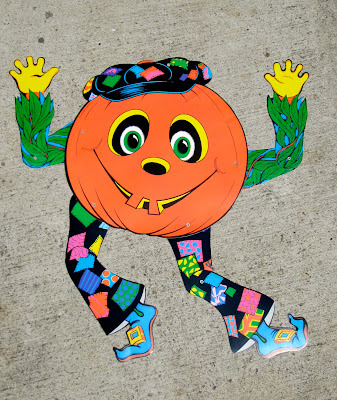 I used to call this guy the "Funky Pumpkin", but was always reluctant to display him because of his silliness. Wish I had one now! 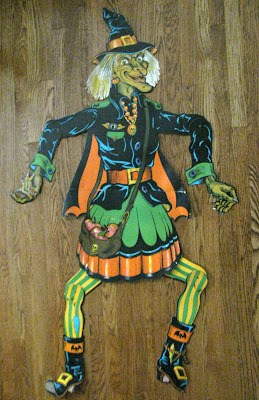 We had that same witch on our front door! I would love to have one again, also. That pumpkin is ready to do the hustle! Gotta do a blogpost about my favorites one day. I have some of the smaller reproduction die-cut decorations, but I guess they don't make the jointed ones?